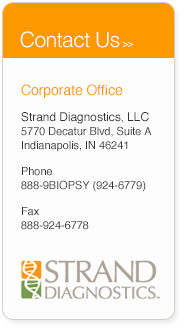 Strand Diagnostics, LLC. developed and markets the know error® system which uses bar coding, forensic principles and DNA matching to confirm that surgical biopsy samples being evaluated belong exclusively to the patient being diagnosed. Available for a diverse range of tissue types, the know error® system brings diagnostic accuracy, patient and practice safety, confirmation and confidence to the diagnostic testing cycle. Physicians throughout the United States and Canada in a variety of specialties, including breast surgeons, radiology, urology, GI, and oncology, have incorporated the know error® system as a standard for their patient care . Privately owned and located in Indianapolis, Indiana, Strand Diagnostics formed in 2005 as a forensic DNA testing crime lab and still maintains its FBI-accreditation and processes crime-scene samples for a number of public police agencies throughout the United States. Since 2008, Strand Diagnostics has maintained its State of New York and CLIA accreditation and has processed samples from over 300,000 patients. Learn more about Strand Diagnostics in the company video.